The town of Wellfleet has 5 ocean beaches, 5 beaches on Cape Cod Bay and 3 freshwater pond beaches. In season, two ocean beaches collect a daily parking fee. All the beaches allow parking for renters who have purchased a parking permit (one week, two week and seasonal permits available.) On the map, the area in white is under the management of the town of Wellfleet. The area in green is part of the Cape Cod National Seashore. 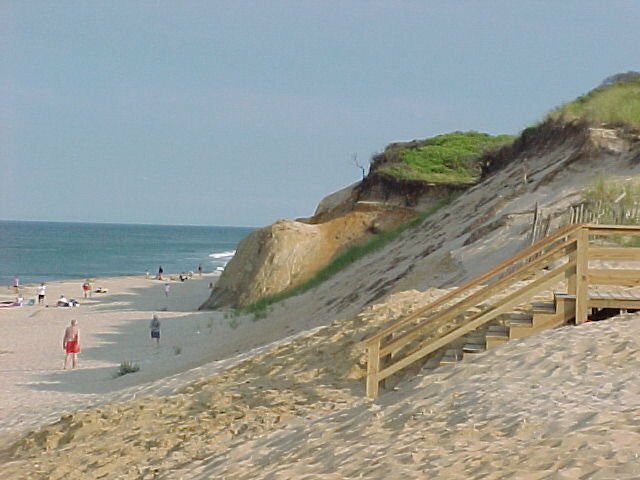 By special arrangement with the National Seashore, Wellfleet manages all of the beaches in town except for Marconi Beach. Purchasing a Wellfleet beach parking permit will allow you to park your car at any beach parking area in town except Marconi Beach where the National Park Service collects a separate parking fee. Lecount Hollow Beach Restrooms Lifeguards Parking Rt. 6 to LeCount Hollow Rd. White Crest Beach Restrooms Lifeguards Parking Rt. 6 to LeCount Hollow Rd. left onto Ocean View Dr.
Cahoon Hollow Beach Parking Lifeguards Restaurant Rt. 6 to Cahoon Hollow Rd. to Ocean View Dr.
Newcomb Hollow Beach Restrooms Lifeguards Parking Rt. 6 to Gull Pond Rd. Left onto Ocean View Dr.
Rt. 6 to E. Main St. Left onto Commercial St. Right at Town Pier onto Kendrick Ave. Follow to end. Rt. 6 to E. Main St. Left onto Commercial St. Right at Town Pier onto Kendrick Ave. Beach is just after junction of Chequessett Neck Rd. and Kendrick Ave.
Great Pond Restroom Parking Rt. 6 to Cahoon Hollow Rd. Long Pond Restroom Parking Rt. 6 to Lawrence Rd. Left onto Long Pond Rd.